But Jesus knew what happened. 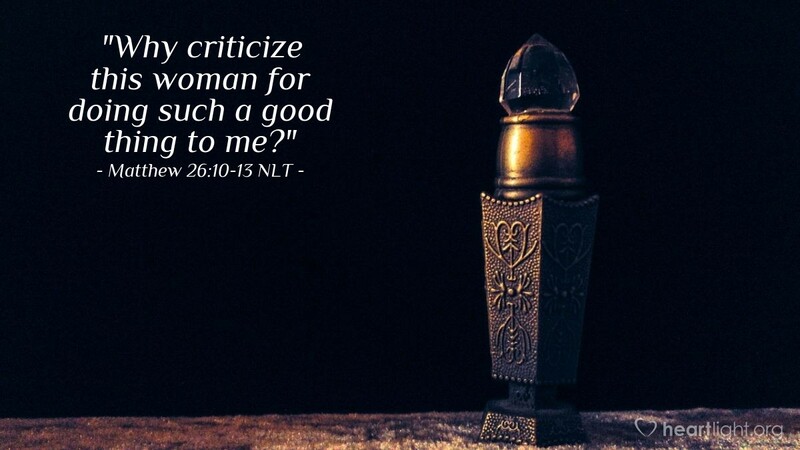 Jesus said, "Why are you troubling this woman? She did a very good thing for me. You will always have poor people with you. But you will not always have me. This woman poured perfume on my body. She did this to prepare me for burial after I die. I tell you the truth. The Good News will be told to people in all the world. And in every place where the Good News is told, the story of what this woman did will also be told. And people will remember her." Part of the Gospel wherever it is told! Wow, what a promise, but the very fact that we're reading this is proof that it is true. The last will be first, the scorned will be honored, and the poor will be made rich. That was Jesus' promise. He is the validation of that promise and so is this woman whose generosity is extravagantly appropriate for the Son of God who is about to be rejected, scorned, persecuted, reviled, humiliated, and murdered. How can the response to such a gift not be extravagant? How can my response to such grace not be boundless? How can I treat God's unrestrained mercy, love, and grace with the normal and restrained thank you's of day-to-day thanks. God's gift is so generous and Jesus' sacrifice is so great, how can I offer only a token word of gratitude and praise? Holy and gracious God, you have given me so much in Jesus. I want to thank you and praise you from the bottom of my heart for your generosity and grace. I want to live extravagantly for your glory and praise you with unrestrained joy and praise. You are worthy of all that I am and have and yet that gift pales in significance to what Jesus has done for me. Thank you, in Jesus' gracious name. Amen.